Mamata Banerjee, Nitish Kumar and HD Kumaraswamy telephoned Telangana Rashtra Samithi (TRS) President K Chandrshekhar Rao to convey their best. The ruling TRS marched ahead of rivals in Telangana, establishing a wide gap with closest rival Congress. 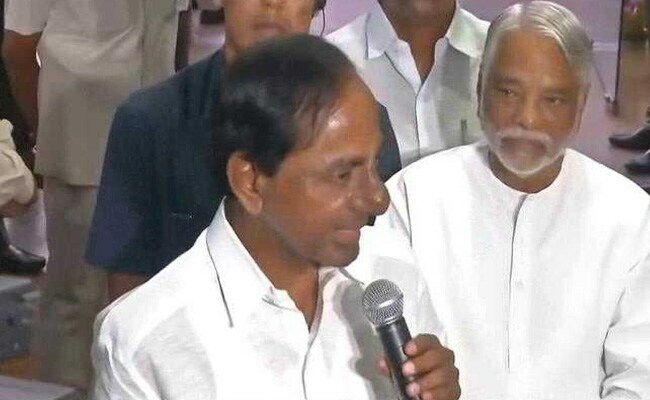 Chief Ministers of West Bengal, Bihar and Karnataka today congratulated their Telangana counterpart K Chandrashekar Rao on his ruling TRS party's performance in the state's Assembly elections. West Bengal Chief Minister Mamata Banerjee, Bihar Chief Minister Nitish Kumar and Karnataka Chief Minister HD Kumaraswamy telephoned the Telangana Rashtra Samithi (TRS) President to convey their best. According to a statement from the Chief Minister's Office, YSR Congress Party President and leader of opposition in Andhra Pradesh YS Jaganmohan Reddy and Sarada Peetam head Swaroopanandendra Saraswati also congratulated CM Rao.